Belgian police arrest 16 suspects in raids across the country late. Capital Brussels to remain under lockdown on Monday. 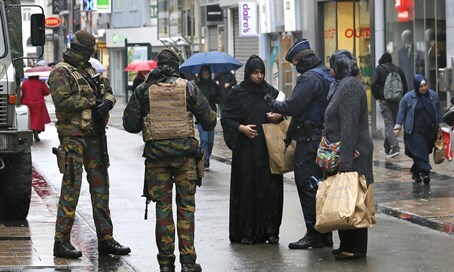 Belgian police arrested 16 terrorist suspects in raids across the country late on Sunday, Reuters reported. However, it does not appear that Salah Abdeslam, who is wanted for his alleged role in carrying out the Paris attacks, was among those arrested, according to the news agency. Earlier in the evening, Prime Minister Charles Michel, speaking after a meeting of security chiefs called to review the threat status, said the capital Brussels' metro, universities and schools would remain on lockdown for a third day on Monday. For the rest of the country, a threat level of three on a four-tier scale would remain in place, Michel said, according to Reuters. Armed police mounted searches in several parts of the capital on Sunday evening and cordoned off areas close to the main tourist attraction, the Grand Place around the town hall. Broadcaster RTBF said there were also raids near Liege in the east, Antwerp in the north and Charleroi, south of Brussels. Possible targets were malls, shopping streets and public transport, Michel said Sunday night, adding the government would boost police and army presence in the capital beyond already high levels. Last week, Belgium's security services were on the defensive when they were accused of blunders, infighting and worrying leniency towards radicalism that let the perpetrators of the Paris attacks slip under the radar. French President Francois Hollande said last week that the attacks were "planned in Syria, prepared and organized in Belgium", specifically from the impoverished immigrant district of Molenbeek.